Browning 1919 A4 - Converted to 308, Semi- Auto, Crankfire System, Nice Tripod, $2,900. Call 865-475-3776. New Rock Island 3-N-1 Shotgun - $269 Call 865-475-3776 Winchester XPR .270 Rifle 865-475-3776 Several new and used long- gun and handguns in stock at all times. Call 865-475-3776. Remington Rifle, Pre-1900 Single Shot, Rolling Block, Re- barreled to 44 cal. Creedmore Numrich Arms Barrel. Re- loading kit & ammo included. $650. Call Joe at 423-532- 8140. Mossberg Persuader, pistol grip, shotguns, new in 20 ga. for $289 or 12 ga. for $319. 865-475-3776. Ruger Mini 30 762-39 Stain- less Steel Rifle, black stock, one 20 Rd. magazine and ny- lon sling. $900. Call or leave message. 865-919-6066. LAKEWAY TREE SERVICE 423-438-9995 Winchester XPR .308 Rifle 865-475-3776 New Riley Defense AX-47! Made in Charlotte, NC with American Milled Parts, great looking rifle! $619. 865-475-3776. Pawn Loans • 15 Day Check Advances 30 Day Car Title Loans NEED FAST CASH? WE LOAN MONEY ON ANYTHING OF VALUE! WARM WEATHER BRINGS NEW ITEMS & NEEDS! ALWAYS A LARGE SELECTION OF NEW & USED FIREARMS! DIXIE PAWN SHOP DIXIE PAWN SHOP DIXIE PAWN SHOP DIXIE PAWN SHOP 865-475-3776 215 E. Broadway • Jefferson City OF JEFFERSON CITY ©SMTPUB INC 215 E B d J ff WE PAY TOP DOLLAR FOR GOLD! WE PAY TOP DOLLAR FOR GOLD! SPRING IS HERE! S! VALUE! ©2016 The Smoky Mountain Publishing, Inc. ©2016 The Smoky Mountain Publishing, Inc. Weekly Weekly DROP OFF OR MAIL US THIS FORM! OR USE YOUR DROP BOX OUTSIDE OUR OFFICE!! OR FAX TO 423-587-2906 5063-1 West A.J. Hwy., Morristown, TN 37814 FOR BUSINESS RATES PLEASE CALL 423-587-1700 $5: Basic Ad $6: Bold & Centered Ad $7: Border Ad $8: Bold, Centered & Boxed Ad $10: Photo/Logo Ad BUY 4 WEEKS - GET 5TH WEEK FREE! $30: Run Until It Sells ($50: W/1 Picture) *Cost are per week (unless otherwise noted) and must contain 30 words or less. It is $1 for each additional 10 Words. Call for Business Rates. FREE: Yard Sale Ads or Items Under $100 *Classifieds must be received by Tuesday at 5 p.m. for the Thursdays Publication. Weeks with holidays, deadlines may change without notice. Not responsible for cash sent in the mail or in the drop box. Other restrictions may apply. These rates are good for private party only. Business rates need to call 423-587-1700 for current business rate. We have the right to determine what ad is a business ad. Name: Phone: Street: City: State: ZIP: AD Info: Category: We Also Accept Visa, MasterCard, American Express and Discover. Card Number: PLEASE INCLUDE CHECK, CASH OR MONEY ORDER. Exp. Date: CCV #: 30 WORD LIMIT ($1 PER 10 WORDS, PER WEEK) TOTAL COST: Make checks and money orders to The Smoky Mountain Trader. YES SUBSCRIBE ME TO THE FREE ONLINE EDITION! Email: I give permission to allow the Smoky Mountain Trader to add me to their email subscription list. 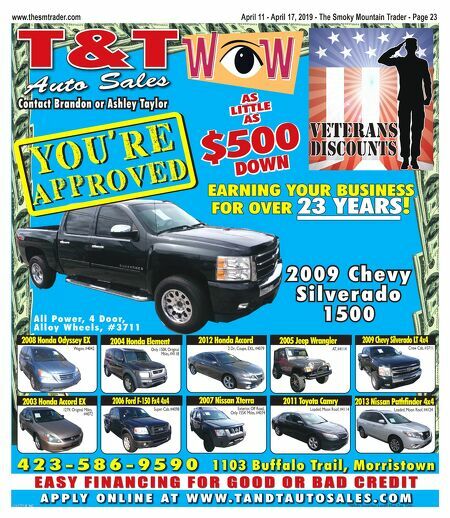 The Smoky Mountain TRADER is published EVERY Thursday and circulated throughout the Lakeway area. 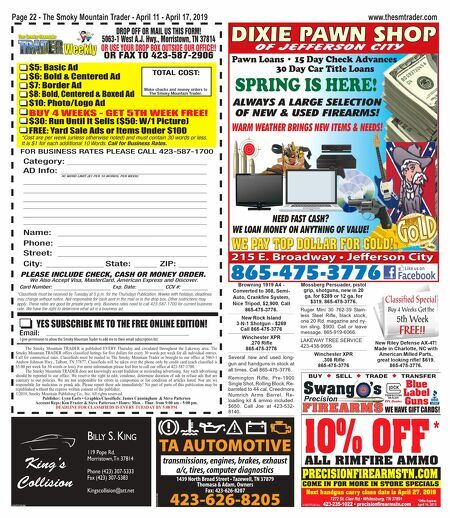 The Smoky Mountain TRADER offers classified listings for five dollars for every 30 words per week for all individual entries. Call for commerical rates. Classifieds must be mailed to The Smoky Mountain Trader or brought to our office at 5063-1 Andrew Johnson Hwy., Talbott, TN 37877. Classifieds will be taken over the phone only by credit card (each classified is $5.00 per week for 30 words or less). For more information please feel free to call our office at 423-587-1700. The Smoky Mountain TRADER does not knowingly accept fradulent or misleading advertising. Any such advertising should be reported to our office. We reserve the right to edit, condense, determine duration of ads or refuse ads that are contrary to our policies. We are not responsible for errors in compostion or for condition of articles listed. Nor are we responsbile for malicious or prank ads. Please report these ads immediately! No part of parts of this publication may be republished without the express written consent of the publisher. ©2019, Smoky Mountain Publishing Co., Inc. All rights reserved. Publisher: Lynn Earls • Graphics/Classifieds: James Cunningham & Steve Patterson Account Reps: Ken Frazier & Steve Patterson • Hours: Mon. - Thur. from 9:00 am - 5:00 pm. DEADLINE FOR CLASSIFIEDS IS EVERY TUESDAY BY 5:00 PM Next handgun carry class date is April 27, 2019 7272 St. Clair Rd.• Whitesburg, TN 37891 423-235-1022 • precisionfirearmstn.com Blue Label Guns ©SMTPUB Inc. BU Y SELL TRADE TRANSFER FFL Dealer PERFECTION DEALER WE HAVE GIFT CARDS! *Offer Expires April 16, 2019 COME IN FOR MORE IN STORE SPECIALS PRECISIONFIREARMSTN.COM ALL RIMFIRE AMMO 10% OFF * TA AUTOMOTIVE 423-626-8205 transmissions, engines, brakes, exhaust a/c, tires, computer diagnostics 1439 North Broad Street • Tazewell, TN 37879 Thomasa & Adam, Owners Fax: 423-626-8207 ©TSCPUB INC BILLY S. KING 119 Pope Rd. Morristown, Tn 37814 Phone (423) 307-5333 Fax (423) 307-5383 Kingscollision@att.net King's Collision ©SMTPUB INC Page 22 - The Smoky Mountain Trader - April 11 - April 17, 2019 www.thesmtrader.com Classified Special Buy 4 Weeks Get the 5th Week FREE!! FREE! !